If you followed the evolution of the mobile communications sector, then you would notice that strategic blunders have humbled several large multinational companies -- including dominant telecom system manufacturers, mobile handset makers and proprietary software vendors. In all cases, companies once recognized as leaders in their respective field had to accept defeat. Most of the remaining industry players knew that their relative position in the mobile ecosystem was tentative and subject to ongoing change. That said, CEOs that believe their company is "too big to fail" is the folly that tends to be repeated, over and over again. The absence of strategic foresight at Microsoft has led to a somewhat predictable result -- a retreat from the battle for a sizable piece of the mobile marketplace, leading to an inevitable total surrender. It's an unfortunate outcome. However, there is still opportunity -- even in the most saturated markets. 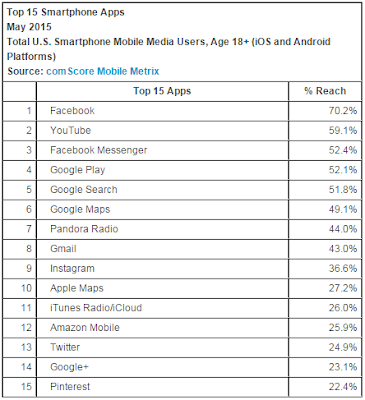 comScore has released data about the key trends in the U.S. smartphone industry for May 2015. Apple ranked as the top smartphone manufacturer with 43.5 percent OEM market share, while Google Android led as the number one smartphone platform with 52.1 percent platform market share. 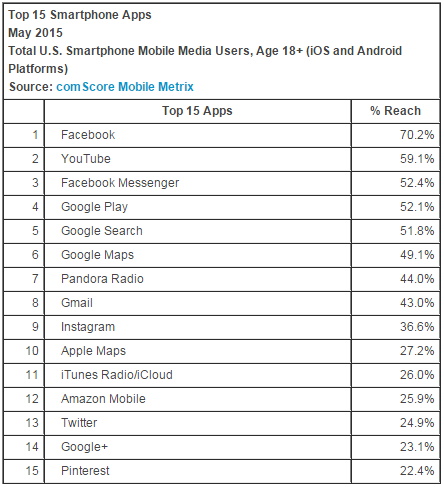 Once again, Facebook ranked as the top individual smartphone software application, and Facebook Messenger has risen to the third most used app. 189.7 million people in the U.S. owned smartphones (76.8 percent mobile market penetration) during the three months ending in May. Apple ranked as the top OEM with 43.5 percent of U.S. smartphone subscribers (up 1.8 percentage points from February). Samsung ranked second with 28.7 percent market share (up 0.1 percentage points), followed by LG with 8.2 percent, Motorola with 4.9 percent and HTC with 3.5 percent. Android ranked as the top smartphone platform in May with 52.1 percent market share, followed by Apple with 43.5 percent (up 1.8 percentage points from February), Microsoft with 3 percent, BlackBerry with 1.3 percent and Symbian with 0.1 percent. Facebook ranked as the top smartphone software application, reaching 70.2 percent of the app audience, followed by YouTube (59.1 percent), Facebook Messenger (52.4 percent) and Google Play (52.1 percent).